Since Albert Einstein first predicted their existence a century ago, physicists have been on the hunt for gravitational waves, ripples in the fabric of spacetime. That hunt is now over. Gravitational waves exist, and we’ve found them. That’s according to researchers at the Laser Interferometer Gravitational Wave Observatory (LIGO), who have been holed up for weeks, working round-the-clock to confirm that the very first direct detection of gravitational waves is the real deal. False signals have been detected before, and even though the rumors first reported by Gizmodo have been flying for a month, the LIGO team wanted to be absolutely certain before making an official announcement. That announcement has just come. 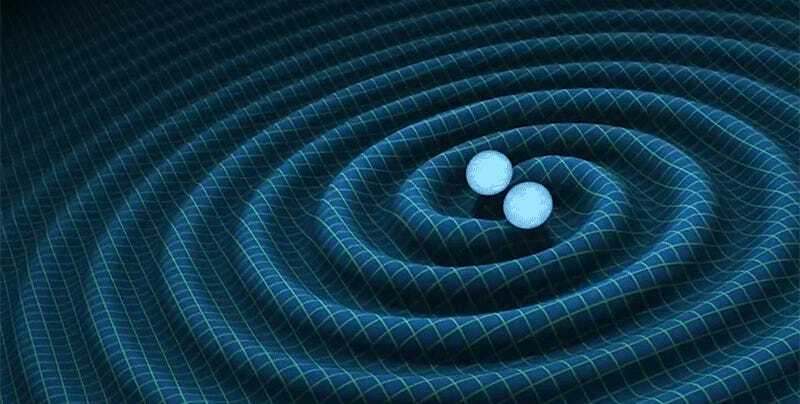 Gravitational waves were observed on September 14th, 2015, at 5:51 am ET by both of the LIGO detectors, located in Livingston, Louisiana, and Hanford, Washington. The source? A supermassive black hole collision that took place 1.3 billion years ago. When it occurred, about three times the mass of the sun was converted to energy in a fraction of a second. The discovery has been accepted for publication in Physical Review Letters. Gravitational waves are ripples in the universe caused by some of the most energetic cosmic events, from exploding stars to supermassive black hole mergers. As they propagate through space and time, gravitational waves cause tiny tremors in atoms that make up matter. While Einstein predicted them in his general theory of relativity in 1916, and their existence was indirectly demonstrated in the 1980s, it wasn’t until the LIGO detector came online in 2002 that the hunt for elusive spacetime ripples started to get serious. But the first generation LIGO experiment, which ran for eight years, wasn’t sensitive enough. Which is understandable. Gravitational waves are minuscule— the atomic jitters that pass through our world when two black holes bash together in a distant galaxy are on the order of a billionth of a billionth the diameter of an atom. LIGO detects them by proxy, using high powered lasers to measure tiny changes in the distance between two objects positioned thousands of miles apart. A million things can screw this up, including a rumbling freight train, a tremor in the Earth, and the inconvenient reality that all objects with a temperature above absolute zero are vibrating all the time. After a series of upgrades that lasted from 2010 to 2015, LIGO was back online this past fall. With more powerful lasers and improved system for isolating the experiment from vibrations in the ground, the prospects of detecting the first gravitational waves have never looked better. Some scientists even predicted that we’d have our first positive detection in 2016—but few could have known how quickly it would come. In fact, LIGO saw gravitational waves almost immediately. The team then spent the entire fall exhaustively investigating potential instrumental and environmental disturbances to confirm that the signal was real. According to Einstein’s theory of relativity, when a pair of black holes orbit on another, they lose energy slowly, causing them to creep gradually closer. In the final minutes of their merger, they speed up considerably, until finally, moving at about half the speed of light, they bash together, forming a larger black hole. A tremendous burst of energy is released, propagating through space as gravitational waves. The two black holes behind the all the hubbub are 29 and 36 times the mass of the Sun, respectively. During the peak of their cosmic collision, LIGO researchers estimate that their power output was 50 times that of the entire visible universe. The discovery of gravitational waves has been an open secret for weeks now. The scientists’ own excitement got the better of them on several occasions, including last week, when theoretical physicist Clifford Burgess at McMaster University in Hamilton, Canada, sent an email to his entire department, telling them that LIGO had found a real, and “spectacular,” signal of two large black holes merging. Now, the muzzle has been lifted and the physicists can geek out at the top of their lungs. Keep an eye on social media today, it should be a ruckus. The discovery of gravitational waves confirms an important aspect of the theory of relativity, but it does much more than that. Quite literally, it opens up a new chapter in our exploration of the cosmos, one where electromagnetic radiation is no longer our only tool for “seeing” the universe. As MIT astrophysicist Scott Hughes told Gizmodo in a phone interview, we can use gravitational waves to probe mysterious celestial objects like black holes and neutron stars, which typically no light. Hughes also notes that once our detectors are sensitive enough to catch gravitational waves regularly, we can start to build a census of the universe’s most energetic events. “Actually getting some demographic data is one of the key things we hope to do in an era of detection,” he said. A century-long hunt is over. But a new cosmic exploration is just beginning.